The newly-weds were spotted at Mumbai airport recently and they looked picture perfect. We think it would be safe to say that we're closely keeping an eye on our favourite couple of the moment, Priyanka Chopra and Nick Jonas. The couple was recently in Delhi post their grand Jodhpur wedding and they even hosted their first wedding reception in the capital, one that was attended by Prime Minister, Narendra Modi. The couple was also spotted at an event in Delhi, making for their first 'official' public appearance. Now, we have spotted the couple in Mumbai. Priyanka and Nick were spotted hand in hand at Mumbai airport recently. 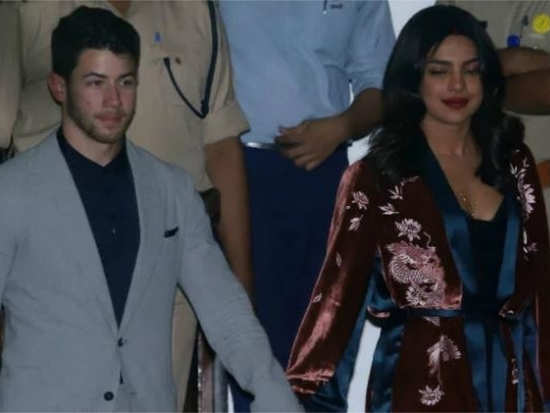 For their trip, while Nick opted for a classy and sharp grey suit styled with a black shirt, Priyanka went the lounge-chic way in a Cinq à Sept outfit comprising of striped tracks teamed with a black top and layered with an embroidered velvet jacket. Bold red lips rounded her look off. Priyanka’s center parting even featured vermilion. We love how desi this glamazon can be! Excuse us for obsessing over these two but can you blame us? Who wore this Prabal Gurung ensemble better: Priyanka Chopra or Katrina Kaif? The first pictures from Nick Jonas and Priyanka Chopra's wedding are now out! 2Who wore this Prabal Gurung ensemble better: Priyanka Chopra or Katrina Kaif? 3The first pictures from Nick Jonas and Priyanka Chopra's wedding are now out! 8Kareena Kapoor Khan or Sara Ali Khan: Who wore Raw Mango better? 9Isha Ambani is the quintessential Sabyasachi bride!